If the horn arrangement on “Twenty-Five Miles” sounds like something out of the Stax studio, that’s because it is. Motown songwriters Harvey Fuqua and Johnny Bristol based their number on the obscure Wilson Pickett song “32 Miles Out of Waycross (Mojo Mama)” written by Bert Berns and Jerry Wexler and recorded in 1967. It’s little surprise Fuqua and Bristol turned to a Pickett number when looking for material for Edwin Starr. Like Pickett, Starr was a strong baritone who sang from the throat. And like fellow Motown family member Levi Stubbs of the Four Tops, Starr’s voice was seeped in the Southern style. Unlike, Stubbs, however, Starr didn’t have a string of hits under his belt, which made him a bit of an outcast at the label. 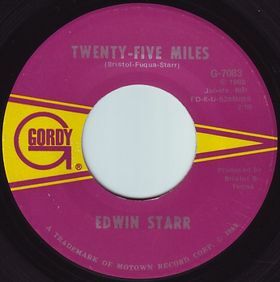 A Detroit native who somehow escaped Berry Gordy’s eagle eye for talent, Starr’s biggest hit. to date was the 1965 song “Agent Double ‘O’ Soul” recorded on the Ric-Tic label. Three years later, when Motown purchased Ric-Tick in 1968, Starr joined the Hitsville stable. “Twenty-Five Miles” opens with Benny Benjamin’s athletic drumming and he stays front and center as the funky scoutmaster that keeps Starr’s (and everyone on the dance floor) feet relentlessly moving. The bass line echoes a horn line that has become a staple of marching and pep bands across the country. The listener never learns what happens when Starr reaches his destination, but the energetic vocals definitely prove that getting there is half the fun. Levi Stubbs’ performance on “Bernadette” cements his status as Motown’s greatest male vocalist. The magnificent feats Stubbs laid down on the Four Tops previous pair of singles, “Reach Out” and “Standing in the Shadows of Love” reaches an impassioned crescendo on “Bernadette.” Stubbs joy, appreciation and devotion to Bernadette is still making women envy that name and that kind of partner. 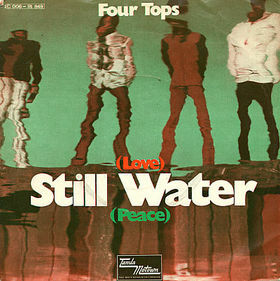 The Holland-Dozier-Holland team that wrote and produced the previous two Tops singles once again employ the same lush orchestration, wrapping Stubbs’ urgent vocals in insistent strings, soaring background vocals and their signature propulsive snare drum. “Bernadette” was the Tops last Top 10 hit until “Keeper of the Castle” took off in 1972. Perhaps coincidentally, “Bernadette” was also the Tops next-to-last collaboration with Holland-Dozier-Holland. 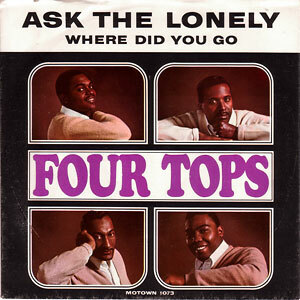 The HDH-Four Tops swan song “7-Rooms of Gloom” hit No. 7 on the R&B charts in the summer of 1967. Although Holland-Dozier-Holland had a handful of hits with Diana Ross and the Supremes before they left Motown in early 1968, “Bernadette” marks the last appearance by the incredible songwriting and production trio on the “Hitsville U.S.A.” set. After Holland-Dozier-Holland departed, Berry Gordy placed all his best songwriters on Diana Ross and the Supremes and other pet artists like the Jackson 5. Groups that weren’t assigned to a producer – as the Temptations were to Norman Whitfield – floundered as the Hitsville transitioned. Many groups, including increasingly ignored girl groups like Martha and the Vandellas and the Marvelettes never regained their former glory. As free agents, the Holland-Dozier-Holland team continued to turn out hits like Freda Payne’s “Band of Gold” and “The Day I Found Myself” by Honey Comb, but neither HDH nor Motown were ever as good again after they parted ways.